This super exclusive watch from Citizen is an ideal accessory for those special occasions. Gold-plated and featuring a mother of pearl dial and stone set case, this glamorous watch will add a dash of style to your look. Exclusive to H.Samuel. 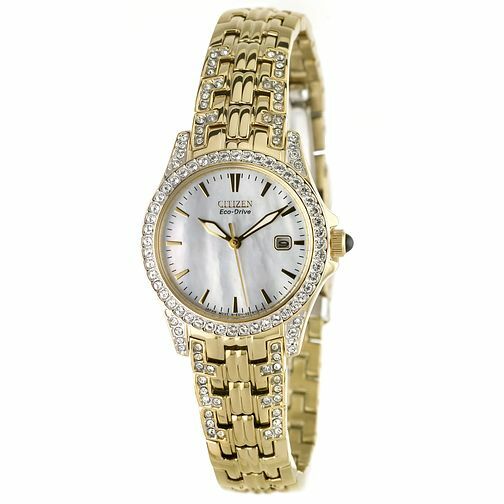 Citizen Eco Drive Exclusive Stone Set Bracelet Watch is rated 4.7 out of 5 by 6. Rated 5 out of 5 by Anonymous from Absolutely beautiful, incredibly durable. Bought as a gift, this watch is fantastic, looks really good and is solid too. Highly recommended.